"...Where Insomnia Hits the Ice." "Once more unto the Breach, dear friends, once more"
I don't know whyyyyyyyy I added the above citation, because I assume that all of you read your Shakespeare (or saw "Sherlock Holmes: A Game of Shadows"), right? What's that? A resounding "HA!" 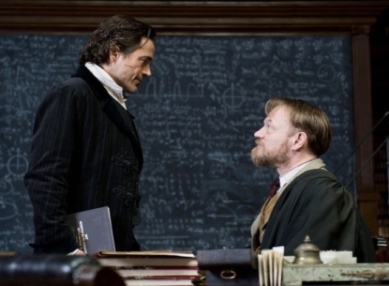 on the Shakespeare and a "Yeah, but I don't remember it" on the (lesser) Sherlock flick? I forgive you on both accounts, but primarily on the Sherlock thing because the Hitchcockian MacGuffin (I won't spoil it, but it amounts to a terrible pun and a freaking flip book) is absurdly convoluted. But seriously Clarke, both the quote and the (lesser) Sherlock movie are at play tonight when the Pittsburgh Penguins and Washington Capitals resume what has become the NHL's best post-season rivalry since the epic Colorado Avalanche/Detroit Red Wing bloodbaths of the early millennium. The Pittsburgh Penguins enter the fray with Sherlock (Sidney Crosby) paired with the reliable Watson (Evgeni Malkin) and find themselves besieged by the nefarious Moriarty (Alexander Ovechkin) and his network of ne'er-do-wells (the rest of the Caps) in a battle for Europe (the Eastern Conference). The Penguins have historically owned the Capitals in the playoffs to a series tune of 8-1. Flyers fans like to point to Philadelphia's home winning streak at the old Spectrum versus the Penguins (and quite deservedly so), and for Washington, the degree of futility versus Pittsburgh in the post-season is comparable. Still, the past is precisely that, and make no mistake, these Washington Capitals represent the toughest challenge the Penguins face on their way to a fifth Stanley Cup. Shuffling back to Sherlock: the element which makes Moriarty such an excellent foil to Sherlock is that he possesses a comparable & impressive skill-set but operates via means the emotionless Sherlock (sound like anybody giving interviews?) will not. This is Sid and Ovie. ...and this is also Sid and Ovie?!?! If the metaphor of players & styles sounds appropriate, then look at those two images. It's as though the roles and scenes were specifically cast for this very series & purpose. Crosby and Ovechkin represent this generation of players' greatest rivalry, and it's pointless to argue the individual merits of one player over the other and vice versa, because they're essentially without equal (although Watson is always there). 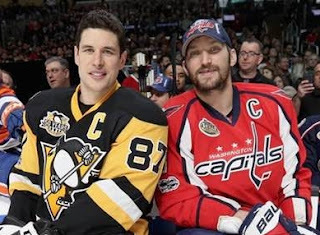 So as the series unfolds, and by all means hope for the Penguins to win (again), take the opportunity to enjoy a rivalry that is infinitely rare in the NHL, because transcendent players (like Lemieux and Gretzky) may never meet in the playoffs. ...and, yeah, well, this too. In a game made trivial due to an apparent horrible injury to Nashville's Kevin Fiala, Fiala's teammate PK Subban sent yet another dagger into the hearts of his old team, Montreal, as Subban erupted for a goal and two assists to lead the Predators past the stubborn Blues, 4-3. St. Louis had drawn even with two goals not even three minutes apart in the third period, but a fluke play coupled with a horrible poke-check by Jake Allen allowed Vernon Fiddler to score a stunning game-winner with just 5:05 left in regulation. The win was Nashville's fifth in a row following an always fun sweep of the Jonathan "LEADERSHIP" Toews' led Chicago Blackhawks, and effectively plundered away home ice from the Blues. The Oilers scored four times in a wild third period and skated out of Anaheim with a 5-3 lead and a change of home ice advantage. Former Penguin Mark Letestu scored twice on the power-play (no, that is not a sentence-long typo) and defenseman Adam Larsson scored two goals and chipped in an assist to pace Edmonton. Like the St. Louis Blues had done earlier in the night, the Might Ducks had pulled even with two quick third period goals, but saw that lead evaporate on Larsson's behind-the-net-even-a-blind-squirrel-finds-a-nut bounce off of an Anaheim defender's skate in past goaltender John Gibson, who didn't exactly have the best of nights between the pipes. Leon Draisaitl would then ice the game with an empty-netter with just over a minute to go, ending any semblance of suspense. Enjoy Thursday night's hockey games running concurrently against the first round of the NFL Draft (because of COURSE they are), and try to keep track of how many times Alexander Ovechkin charges someone in Black & Gold!